Hi, everyone! How are you today? I had such a wonderful weekend. I baked with my husband and even attempted to make some cheese… but don’t ask about that! LOL. Anyway, I am super happy and excited because the weather is finally changing and the sun is shinning. 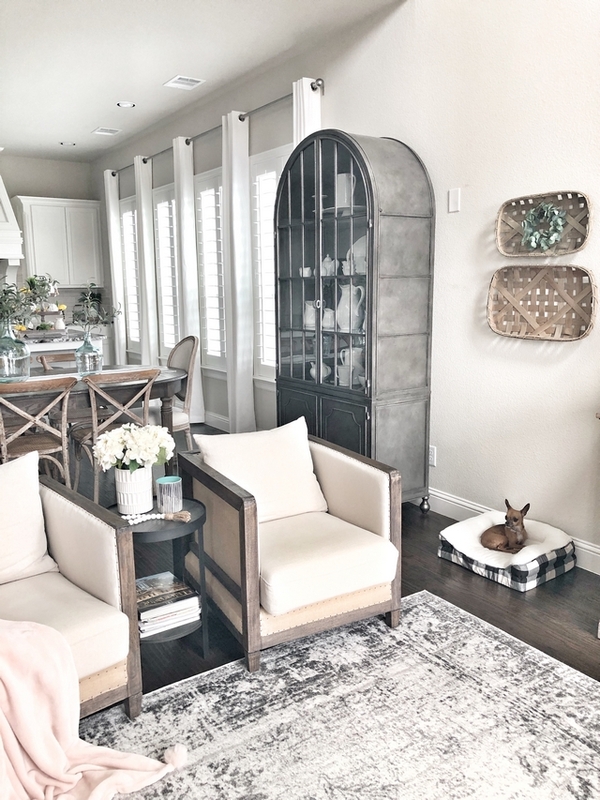 I am also very happy because I adore Callie of @ceshome6 and her style so much that this is the second time I have her on my “Beautiful Homes of Instagram” series. 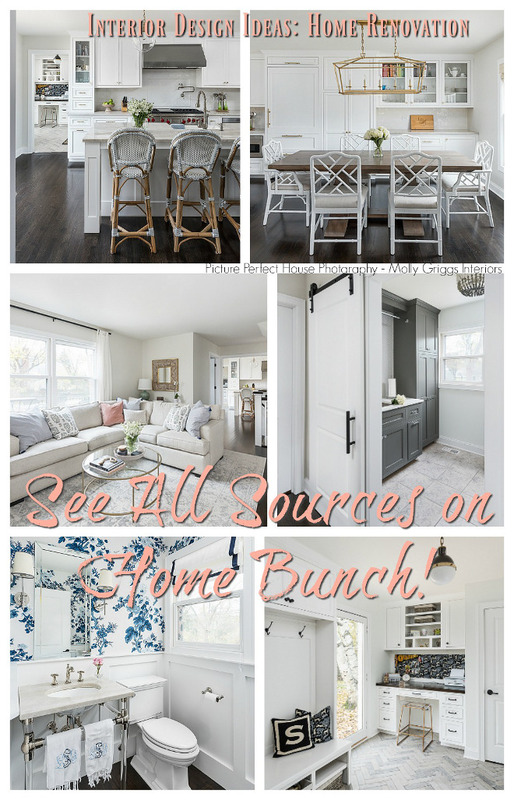 The first time, I shared her previous home (you can see it here) and it became one of my most-pinned posts! 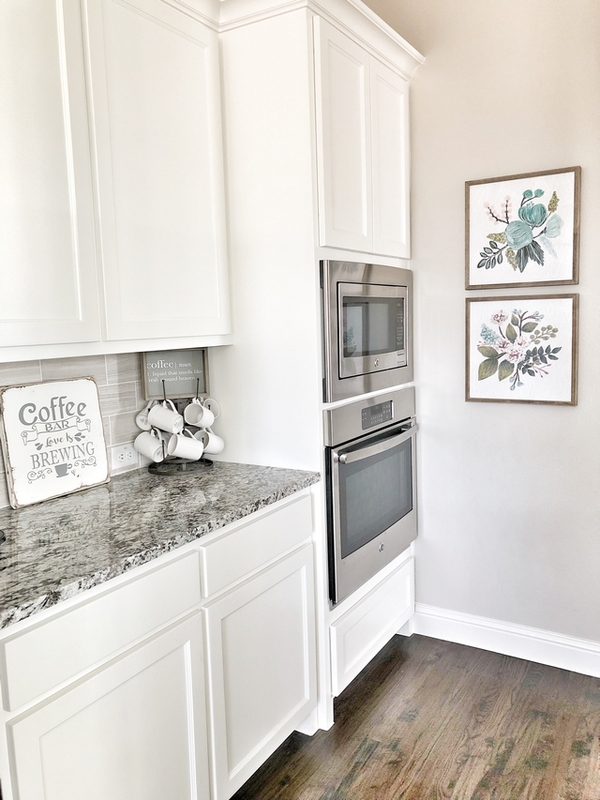 Today, I am proud to be sharing Callie’s new home and I am sure you will enjoy seeing and knowing all details as much as I did! 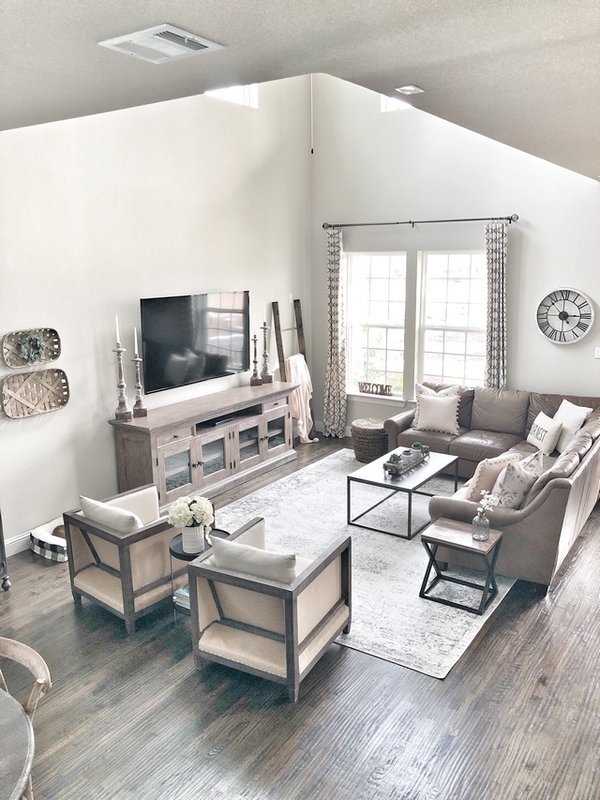 “My husband and I were originally from a small town in North Texas near Oklahoma. We have known each other since kindergarten but didn’t start dating until our junior year of high school. After graduation we moved to the Dallas area for college and have stayed close ever since. We will have been married for 15 years this July and have 4 beautiful children; a 17 year old daughter, a 14 year old daughter, a 9 year old son, and a 5 year old daughter. I feel very blessed to be able to stay at home with them and take care of our family and home. We had planned to build a home again but during our search I found this spec home and the moment I walked in I loved it. 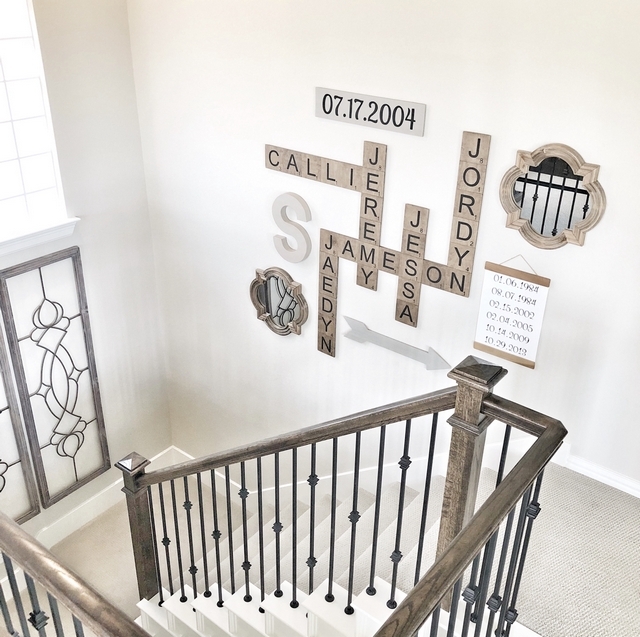 It was my style with the color selections and it was the perfect size for our family. Another bonus was that it was already complete and ready to move in. We went for it and two months later we moved into our new home. 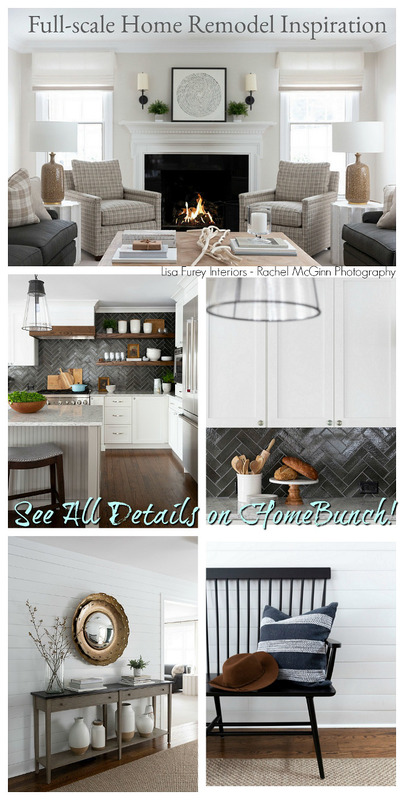 What first caught my eye about this home was definitely the white exterior. 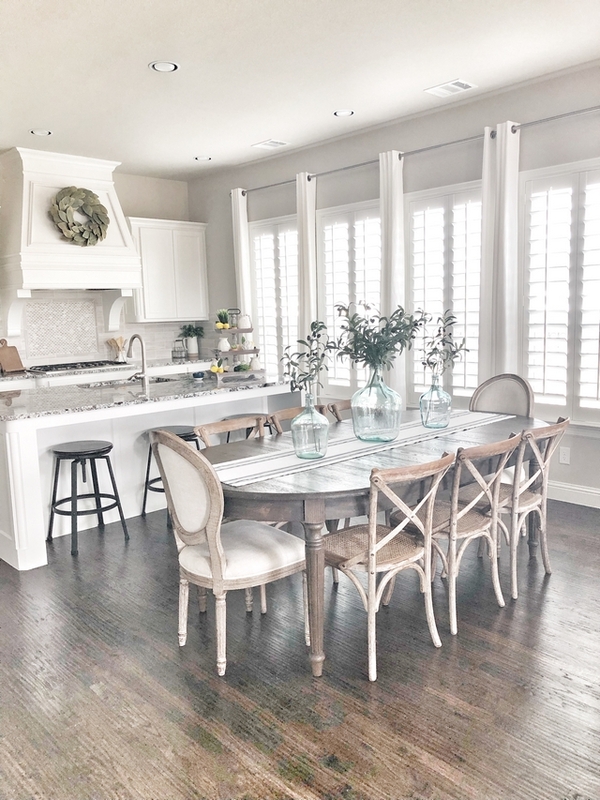 There’s something about a white home! I was sold before I even walked in. The 2 porches in the front were also a huge selling point because we love to sit outside and watch the kids play. We have a huge open space in the front of our home that’s almost the size of a football field and perfect for football, baseball or soccer. The exterior brick paint color is PPG Atrium White and shutters are PPG Black Forest. 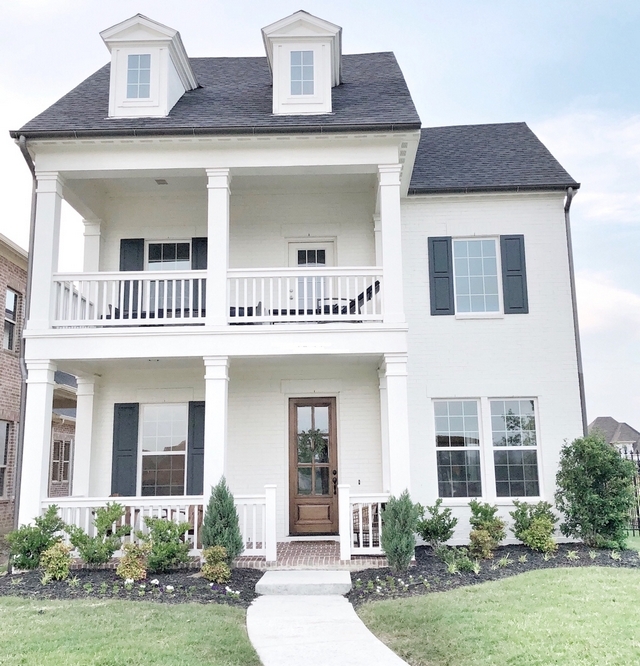 We love that this home has 3 outdoor spaces including a front porch, a patio balcony and a side patio. 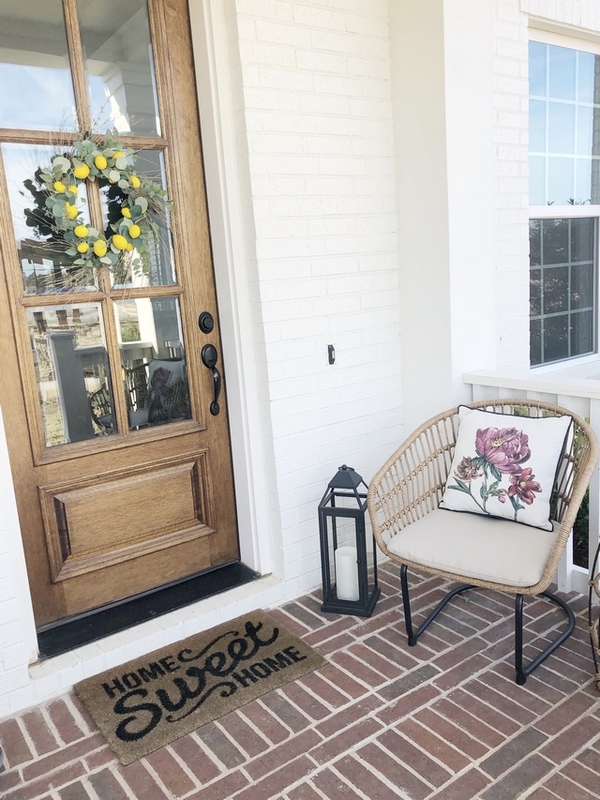 A pair of outdoor chairs make this front porch feel even more inviting. 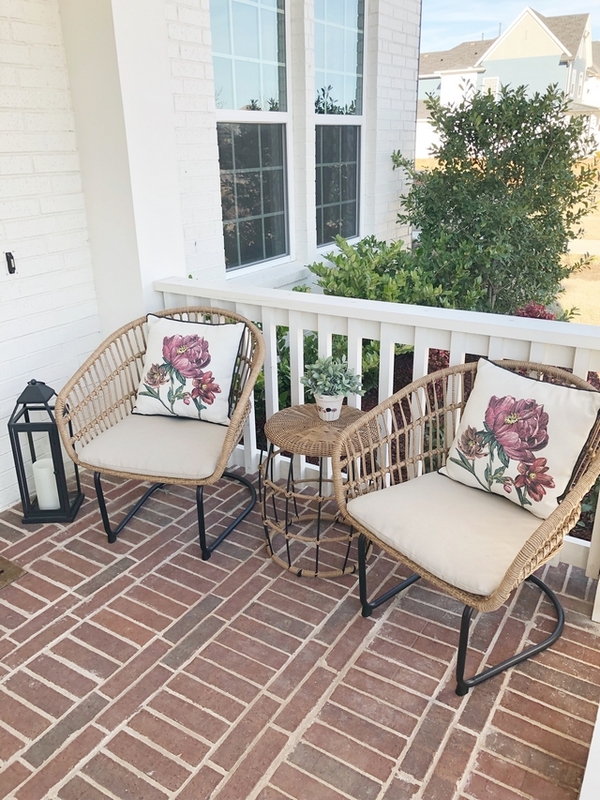 Beautiful Patio Sets: here, here, here, here, here & here. 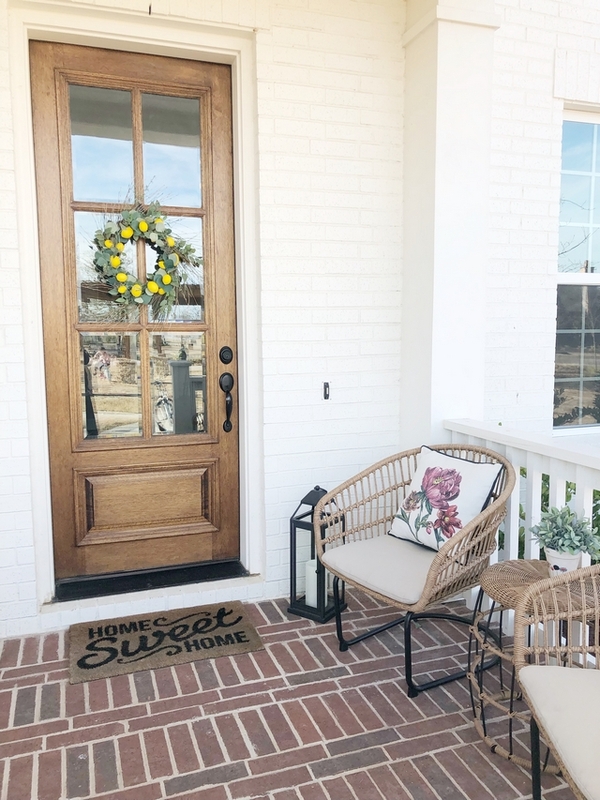 The front porch also features brick flooring in a beautiful pattern. 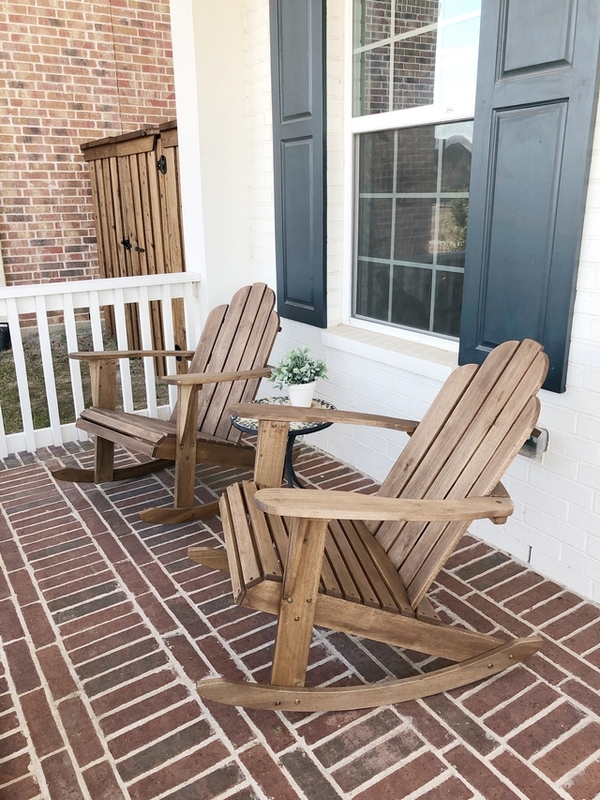 Adirondack Rocking Chairs: here – similar. 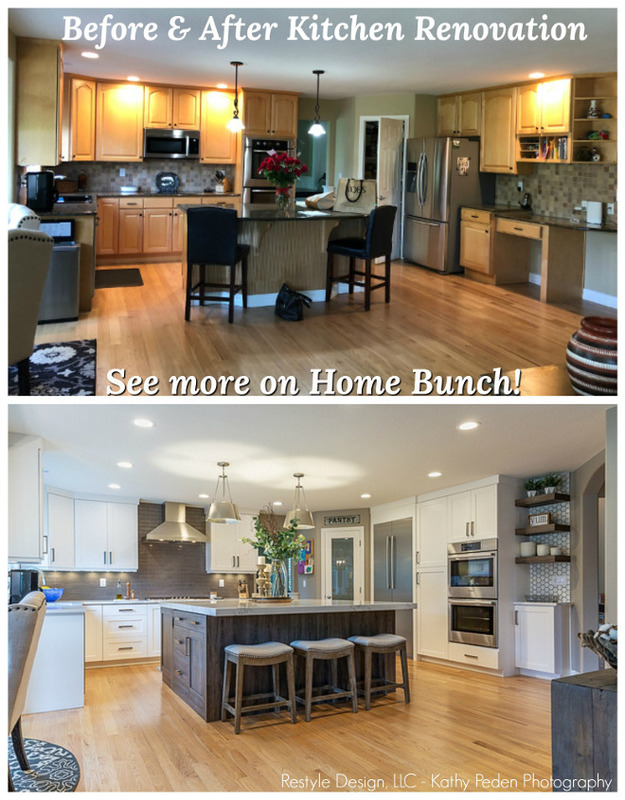 Callie’s home feels happy and welcoming from every angle! I absolutely love Callie’s kitchen. It’s open and spacious without feeling overwhelming. 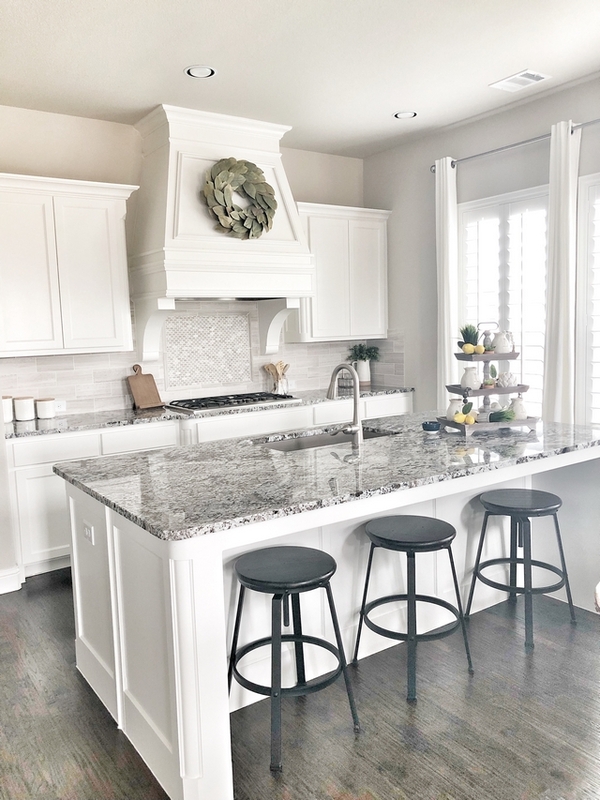 The kitchen backsplash tile is Emser Tile 4×10 Metro Honed with an accent over the stove in Emser 12×12 Metro Mosaic. Counterstools: Target – no longer available – similar here – Others: here, here, here & here. Magnolia Wreath: here – similar. The kitchen countertops are Granite in Lennon. Beautiful 3 Tiered Wooden Trays: here & here. 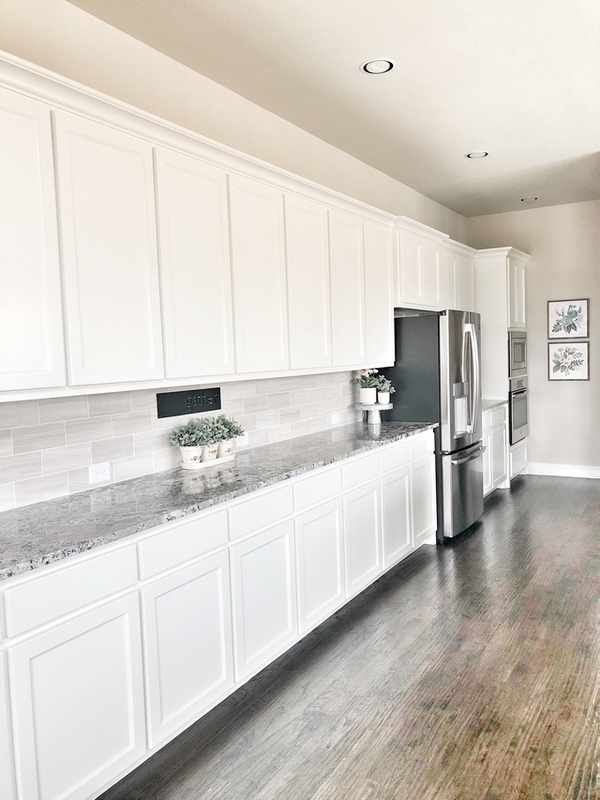 The best part of the kitchen is the long buffet countertop that’s perfect for entertaining because we like to host parties. This counter space runs almost 15 feet long so it holds all the food you could eat. 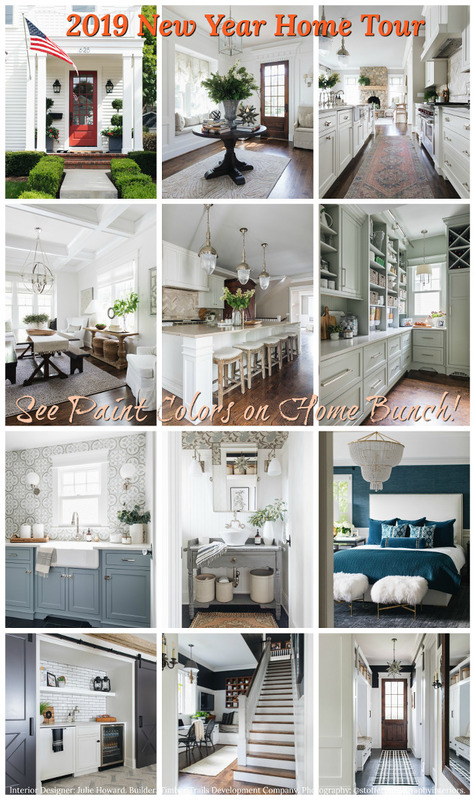 The cabinet paint color is PPG Gypsum in semi-gloss. This entire space is perfect for entertaining. 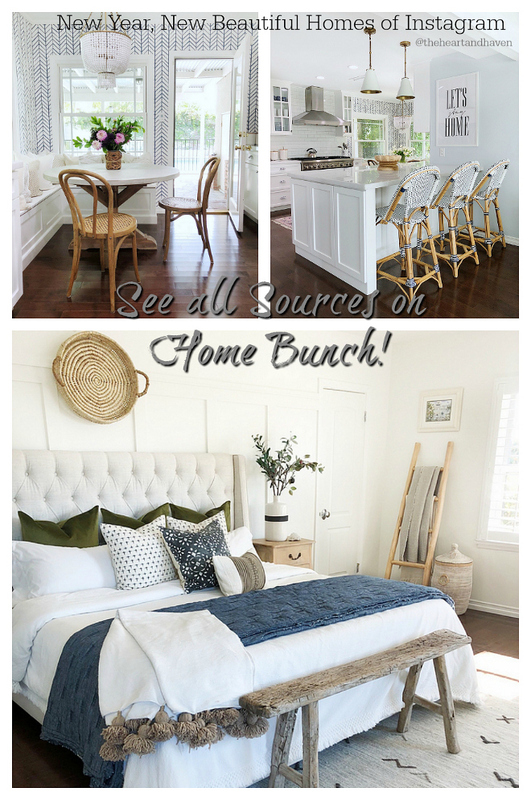 Linen Chairs: RH – similar here & here. 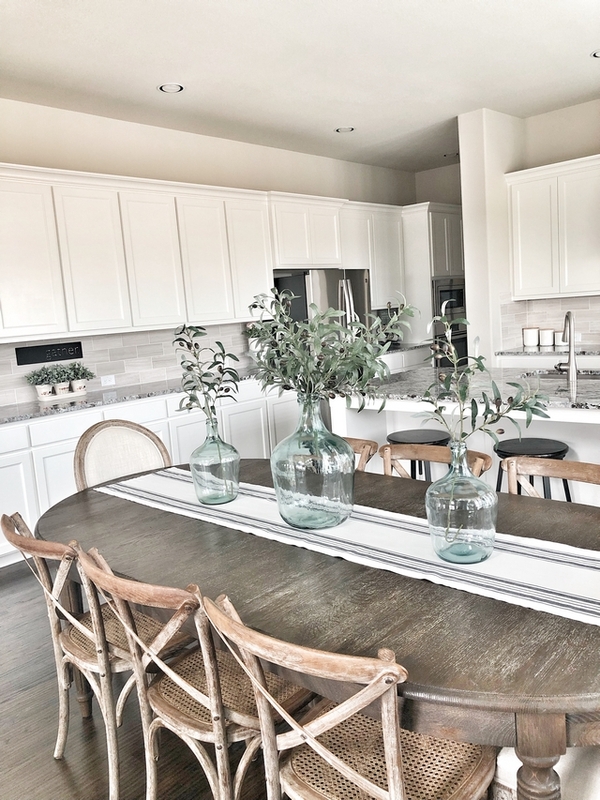 Kitchen Table: Restoration Hardware – Other Beautiful Dining Tables: here, here, here & here. X-back Dining Chairs: RH – similar here (huge sale!). Fruit Spray Olive Branches: here. Table Runner: here & here – similar. The floors in the main living areas are Red Oak hardwoods scraped lightly with the grain and stained ebony. 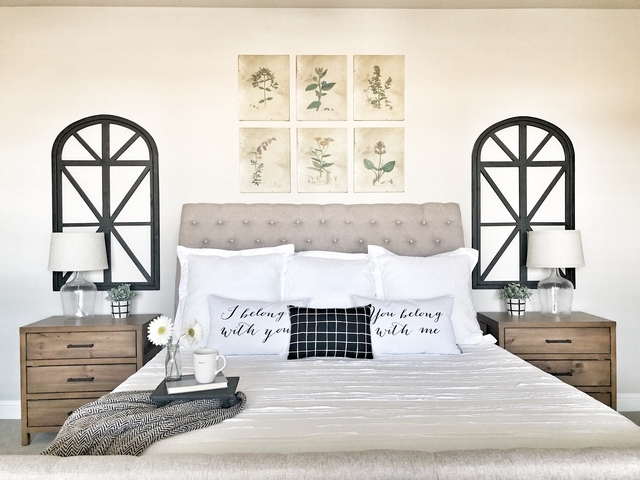 I keep with a pretty neutral theme throughout the year and add in pops of color depending on the season using florals, pillows or artwork. For spring this year I’ve added in light pink, yellow, and teal. This is Jinger – pronounced Ginger… we had to change it to a “J” so she would have the same as the other kids!! I got her own couch for her to go in the living room because she’s been scratching up our leather couch with her nails and she loves it!! Target has the cutest doggie beds! I loved this buffalo plaid one and it goes so well with all my other decor! Metal Cabinet: Universal Furniture Bannister Display Cabinet – similar here & here. Side table: Target – similar here. 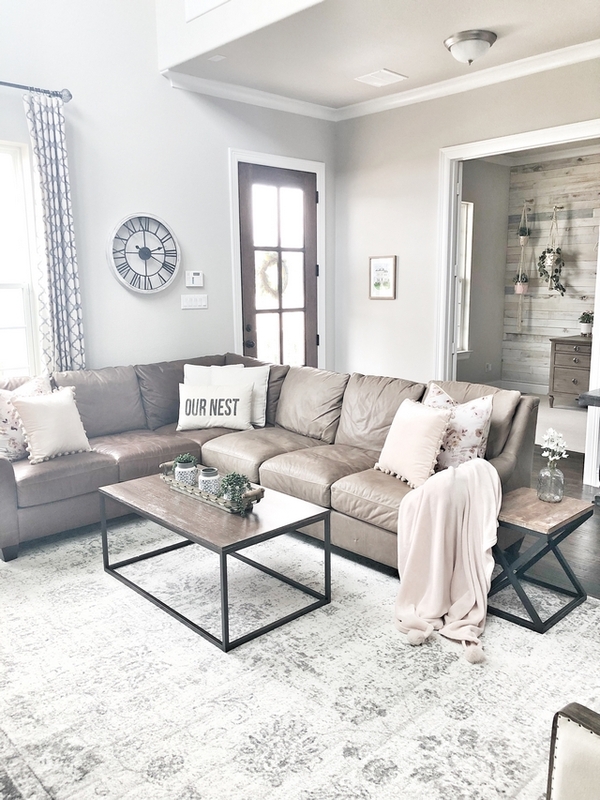 The large leather sectional is perfect for the entire family to relax and watch something at the end of the day. Credenza: Bassett Furniture Emporium 92″ in Compass Northern Grey – Others: here, here, here & here. 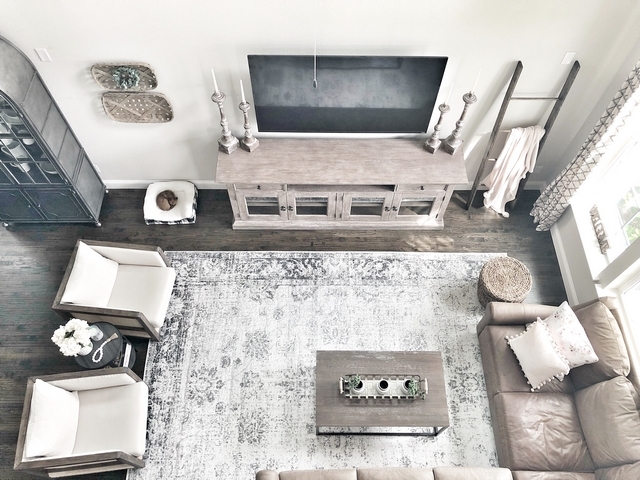 Rug: here (9×12)- Other Beautiful Rugs: here, here, here, here, here & here. The walls and ceilings throughout the home are painted PPG Whiskers in flat. The trim throughout is PPG Gypsum in semi-gloss. 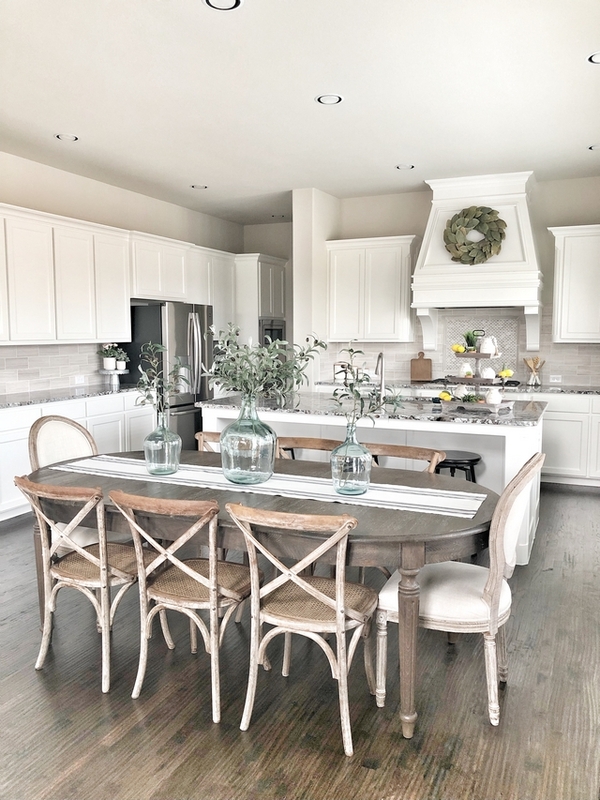 This home is a little unique because when you first walk in the front door you walk right into the living room, dining room and then the kitchen area. It’s one long space. The leather sectional is Bassett Furniture Ellery L-shaped sectional in Stone – similar here, here, here & here. Side table is from At Home – similar here. Beautiful Coffee Tables: here, here, here, here & here. 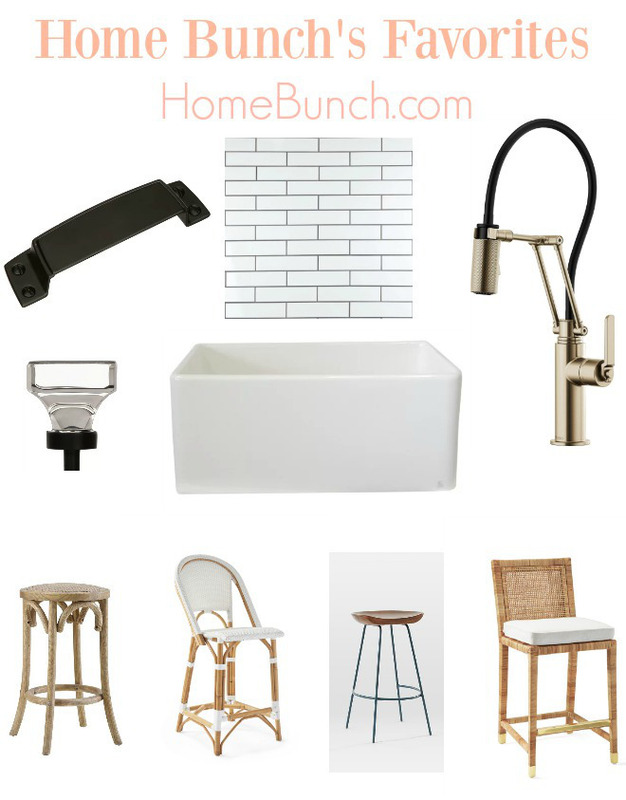 I like to shop for larger furniture pieces at Bassett Furniture, Nebraska Furniture Mart or Restoration Hardware. I’ve found that they all have great quality furniture. 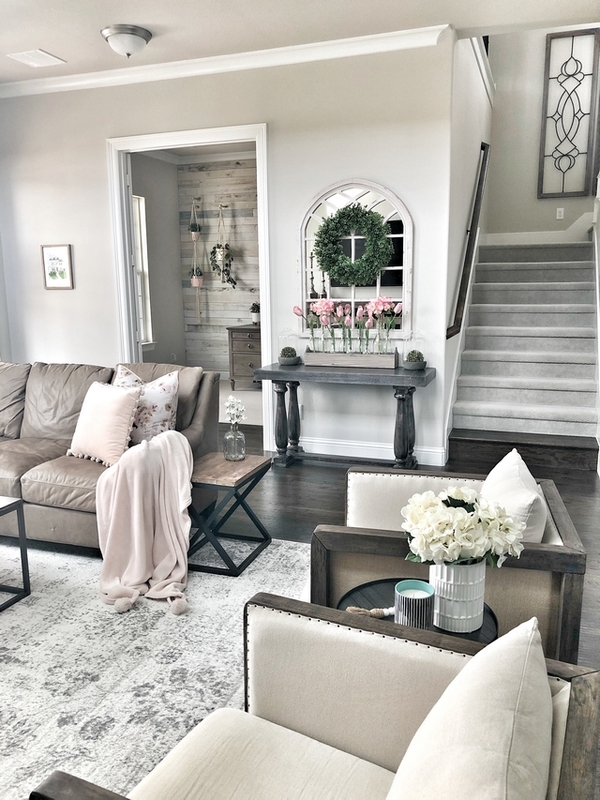 Most all of my small furniture and decor pieces come from Hobby Lobby, Kirkland’s, Homegoods or Target. Decor: Console table – RH – similar here. Throw: Target – Others: here & here. 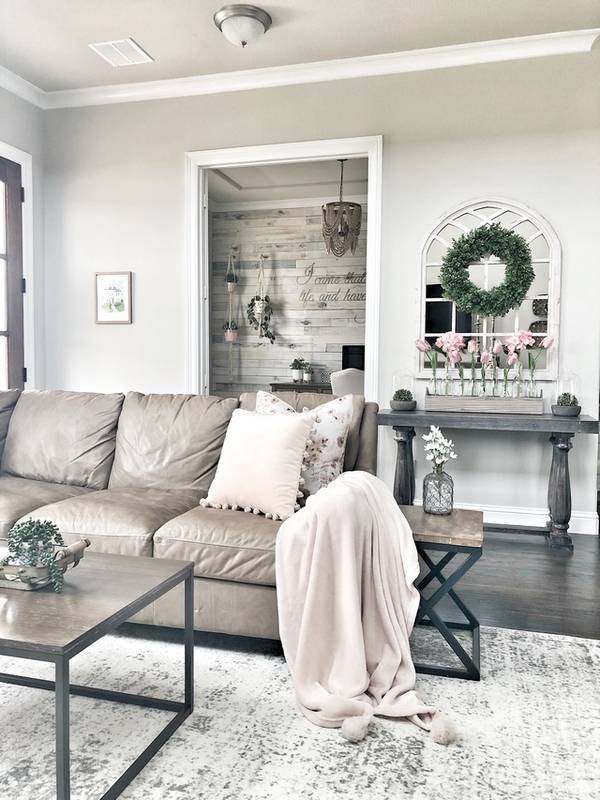 Blush Pink Pillow: here – similar. The wood Scrabble letter tiles feature our names and birth dates. Wood Scrabble Letters: here – similar. The master bedroom is located in the back of the house. 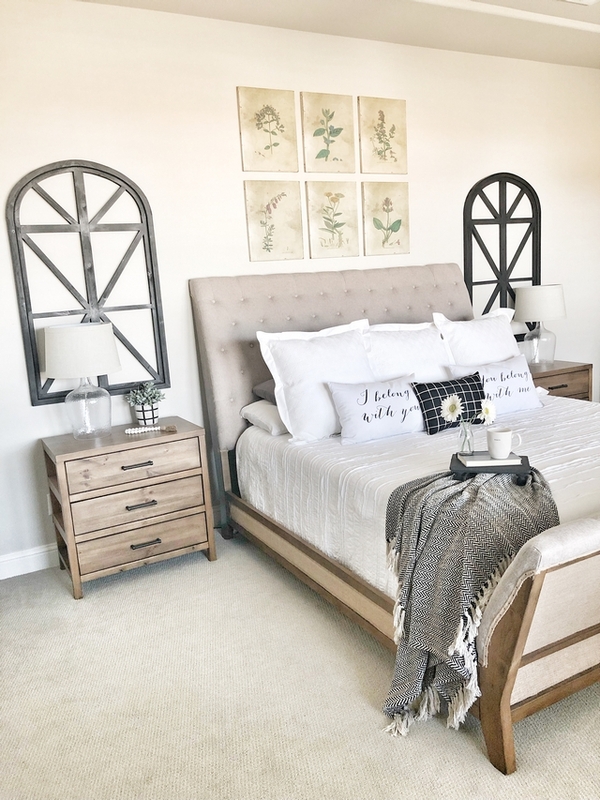 I decided I wanted a black a white theme when I saw a photo from Magnolia Home that had beautiful black wood arched frames behind the nightstands. 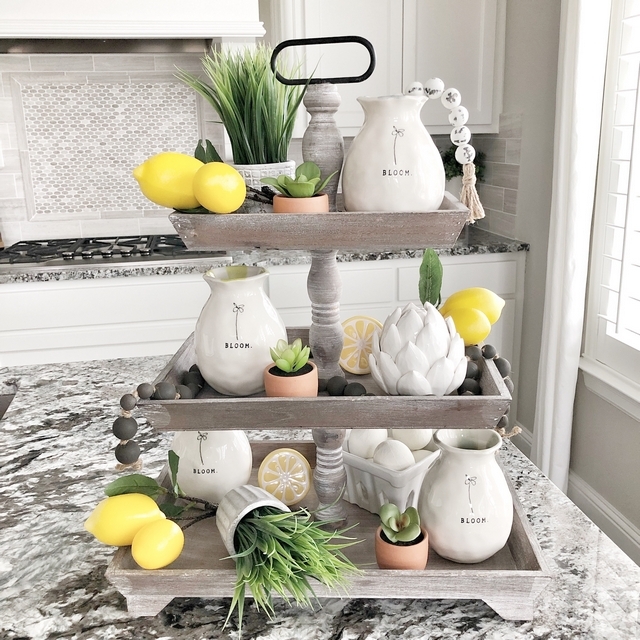 I like to save money when possible so I found my own version from Kirkland’s (similar here) and spray painted them black to get the same look for over half the cost. 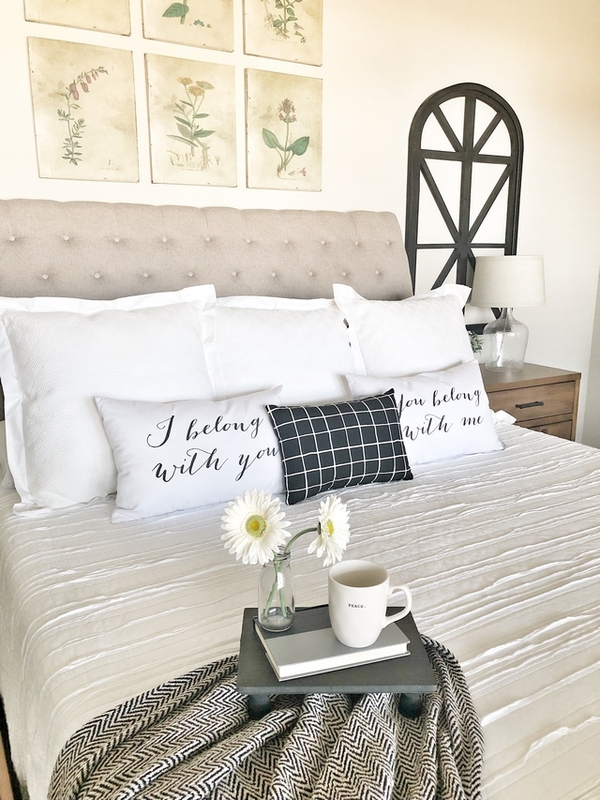 The bed set is from the Magnolia Home line at Nebraska Furniture Mart. The bedding and lamps are from Target. 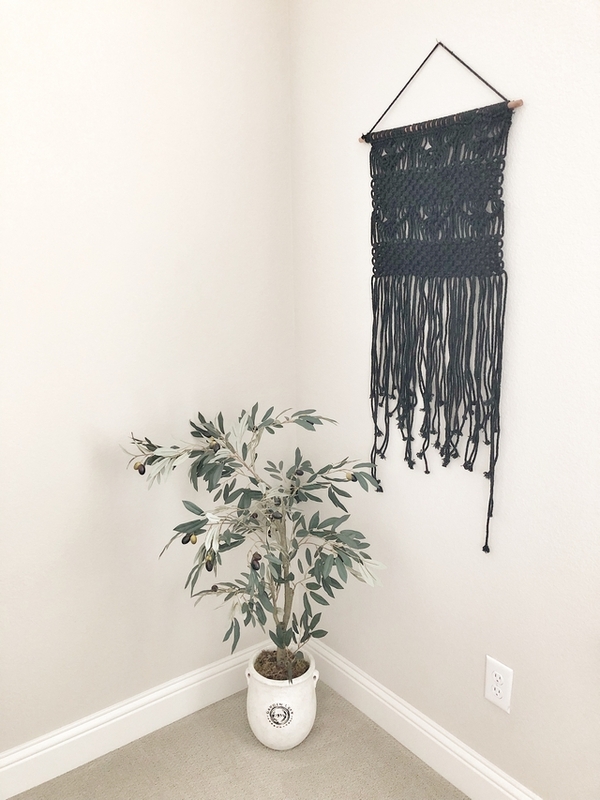 There’s a small corner in the room that was bare so I found this cute macrame wall hanging (similar here) and an olive plant at Homegoods. It’s very simple but I love it. 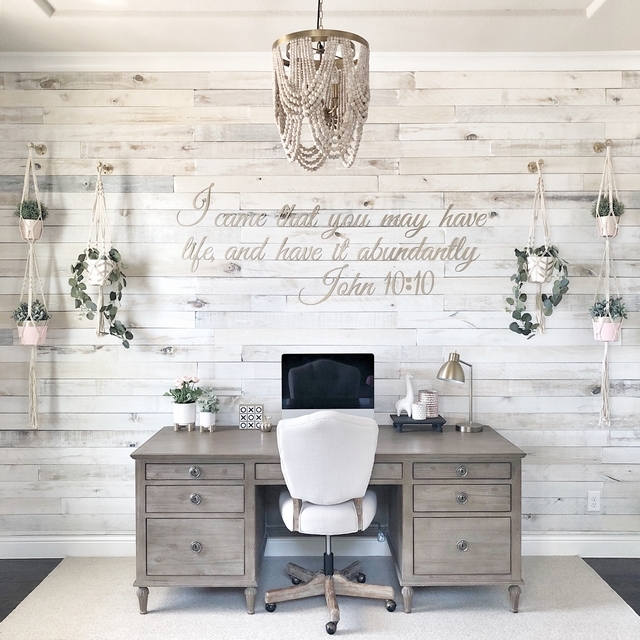 The study is in the front of the home off to the side when you come in the front door. 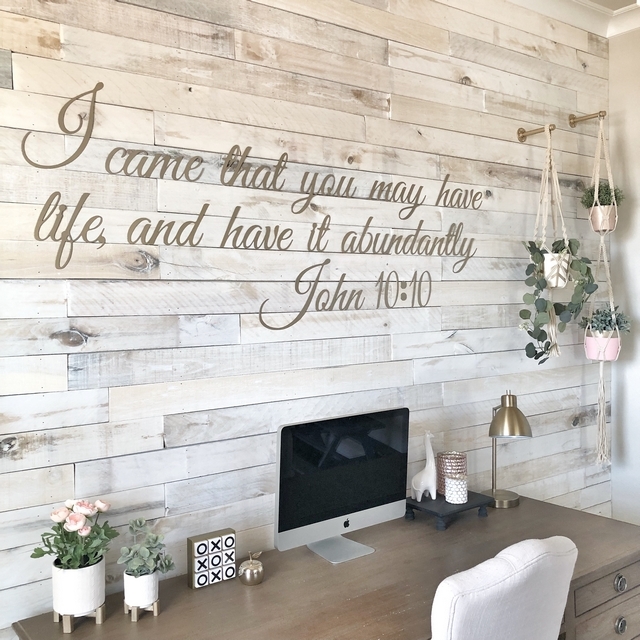 I recently completed a makeover in my study by adding Weaber Lumber white washed wall boards from Home Depot to a focal wall and I love how the transformation turned out. It makes the room so bright and open. I also added greenery with these hanging macrame plant hangers from amazon. I decided to save some money by painting a few terra cotta pots from Hobby Lobby to match my decor and filled them with IKEA plants. To really make the room pop I changed out the lighting to a beautiful wood bead chandelier from World Market. I found this desk at Restoration Hardware a few years ago and both the chair and rug are from Nebraska Furniture Mart. Similar Desk: here – Others: here, here, here & here. Metal Sign: Vintage Metal Co. Many thanks to Callie for sharing all of the details above. 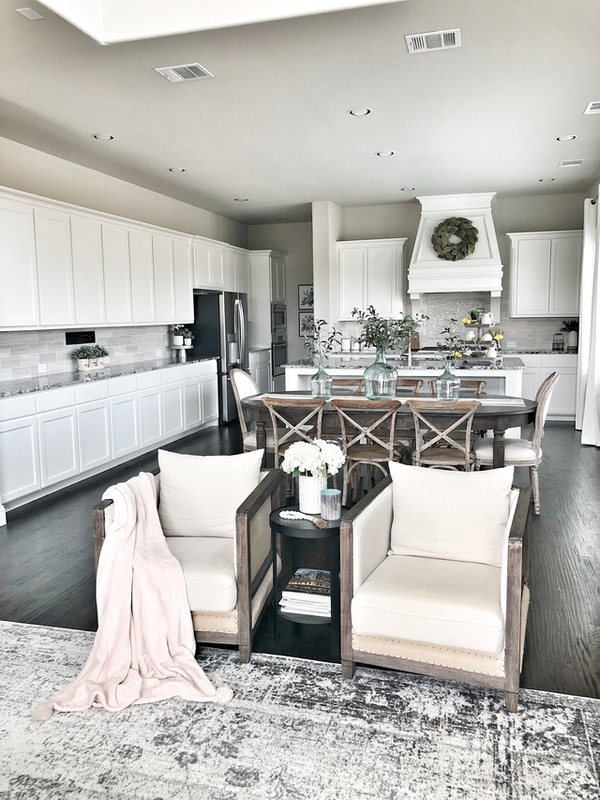 Make sure to follow Callie on Instagram to see more of her beautiful home! Before & After Bathroom Renovation.